Last week I bought some 4 metre long cabinet tracks which came in an equally long cardboard tube. I hadn't decided what to do with the tube yet (attempt to post it?, put it in our recycling bin with it sticking 2.5 metres into the air? Ask someone to look after a poster for me, then produce that?). 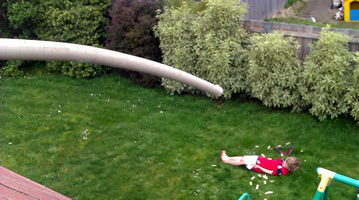 This afternoon the cousins came down and quickly found the perfect use for it - the cannonball challenge.... It required a great deal of teamwork to get the cannon aimed appropriately, and as the missiles (Jenga blocks) occasionally got stuck, the tube would sometimes just spit out a whole lot at once. It was hilariously fun to watch them all working together and even the target co-operated in the operation.